What'll I be, my darlin'? Now all together, let's do all 3 three. Move your body like this with me. The life of a butterfly, darlin'. Today’s color is purple. Can you make a butterfly out of shades of purple? Try making different shades of purple paint and then paint butterflies. Butterflies can have the color violet on them. 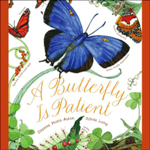 Learning about butterflies in A Butterfly is Patient by Dianna Hutts Aston. Learn about butterflies from Enchanted Learning!